The temptation to diminish your own light is often around you in various thought-forms, created by beings that seek to have control over all of you. Whether you as an individual choose to engage those thought-forms as your own is the question. Do you want to identify yourself and your world with negative self-images, or do you want to engage in positive and benevolent forms of thought? The answer to this question is a fuel which you may use to help manifest the reality that you see before your eyes. We of the higher realms wish to encourage you to choose benevolent and positive self-images and focus, even while staying neutral, detached and serenely aware of the polarities in this existence that you share together on Earth. For now, Earth is your university, but like all students, you are to graduate and move on and expand your education even further. Now, with “Oumuamua” traversing through your galaxy, unaffected by the gravitational pulls of the celestial objects it passes by, you are given certain and very real indications of life throughout the universe, but again this is your choice of whether to recognize the greater scope of your existence, or to continue to try to confine your consciousness within a very limiting box, where negativity and polarity reign, and where you feel that you are the only sentient beings living in the entire infinite universe. The wake-up calls that you have been demanding have been offered once again, but will you rise to meet this fresh understanding, or will you once again obey the demands of your oppressors and negate this awakening so that your minds may continue to be controlled, and so that you may continue to live in denial and ignorance of your brothers and sisters throughout space and alternate dimensions of reality? How long will you allow those who have committed the greatest crimes to lead you? How long will you deny the divinity within yourselves? How long will you identify yourself with limits, and degrade your own self-worth? How long will you diminsh yourselves so much that you can’t bear the idea of interacting with advanced and benevolent beings? What you are seeing with “Oumuamua” is an extra-terrestrial spacecraft at a certain level of technology. Within the interior of the geological object which constitutes the exterior of the object “Oumuamua,” there exists (within that celestial object) a hollowed out, technological propulsion system and facilities, upon which a collective of certain extra-terrestrial races reside as they travel through this galaxy. They may or may not be benevolent to you, from your point of view, yet they do exist, and have existed in your galaxy for many hundreds of millions of years. Their designs and goals may not necessarily be beneficial for those of you upon Earth, and yet this “Oumuamua” is most certainly a scientifically manufactured and reality-based spacecraft, operated by intelligent beings whose origins are not from Earth. Therefore, if we may be so bold, this is the kind of evidence of which you seek to clarify for yourselves in your own minds the undeniable reality of life on other worlds. Whether these particular beings are benevolent, neutral or hostile remains for you to discover. And yet, just as “Oumuamua” exists, and just as the beings that are operating within that spacecraft do exist in your reality, so do many other species and alliances of extra-terrestrial beings exist throughout your galaxy and the billions upon billions of galaxies of which you are already scientifically aware, that are beyond your world in all directions. A question you may ponder upon is: when will you begin as individuals acting openly and with honesty to your deeper awareness that beings of all kinds do in fact exist outside the scope of your current reach? When will you allow for the fact that you are not the most technologically advanced nor spiritually advanced race of beings in the universe? Does this certain knowledge humble you? Do you feel as if you should diminish yourself and your value because you are not the pre-eminent species in the universe, or does this awareness of other beings in the universe bring you joy and gladness, filling your minds with wondrous opportunities to share, travel and learn from beings throughout the cosmos around you? We would like to suggest that you begin today to create an expanded space within your minds and consciousness to allow for a much, much larger reality to unfold into your world, for we of the benevolent persuasion have much we would like to share and offer to you and your world, most especially our love for you and your planet. Yes, we must also share with you that there are those in existence who are hostile to you, your world and your existence, and many of these are engaged in a collective which has intruded into your reality, and has, through your own free will, been allowed to operate just outside your physically limited sight, and have engaged in a form of ownership and slavery over you and your world. However, as your world and solar system begin your return towards the center of the galaxy, that physical veil that prevents your seeing their existence is lifting. You may be shocked by what you see, and who you see operating behind the curtains, so to speak. Yet, above and beyond the influence of those extra-terrestrial beings who are hostile to you exist many hundreds of thousands of races of intelligent and benevolent beings of all kinds, not just galactic but what you may term as “elemental” and “angelic” and “inter-dimensional,” who want only the most joyous and loving experiences for you and your planet of beings. For you are also a part of us already, and we care for you as we would our own children and brothers and sisters, equal to us in spiritual worth, and connected to us by the breath of All That Is. We are also here, and want to to let you know that we are also real, and do in fact exist. We may not necessarily need vehicles like “Oumuamua” or spaceships in order to move about the universe, although many of us do use physical forms of transportation, many more of us do not, for we have found more spiritually-suited methods for re-location and even bi-location. This message today is simply a reminder that you can choose to expand your awareness with the evidence that continues to mount that you are not alone in this universe. We wish to suggest that you remind yourselves of this every day, for this will allow for our energies to begin to manifest more prominently in your reality, and at some point in the very near future, you will be able to expand your lives into our realities which we may share together in peace and harmony, for we have already found many avenues and methods to rise above those extra-terrestrial beings of lower expression, so that they no longer have any negative impact upon us at all. We know that you as souls have chosen a series of lifetimes and experiences on Earth in order to produce powerful spiritual lessons for your inner selves, and that those lessons have now come to a point of graduation and expansion. We are here to award you with that diploma of awareness, and offer you the permanent opportunity to connect and join with us in peace and harmony, as you take the next quantum leap forward and upward in you evolutionary spiral, and begin integrating your world with the rest of your solar system, your galaxy and your multi-verse. We are overjoyed to have you amongst us, conscious and aware, once again. Please choose to nurture this awareness in a daily way, and begin acting in faith and trust of its true reality, and this will help manifest all the loving benefits that come with this awareness sooner than later. We welcome you to your universe. May you play and love to your heart’s contentment. Part of what is happening for me, as a person with a gift for healing, is learning how to offer my gift to others, while at the same time learning how to grow and improve my upon my egotistic and emotional responses to the whole process of being involved in a healing for someone. This week has brought numerous challenges for me in this regard, especially since I have started this blog in which I am trying to share my experiences with those of you who have interest in metaphysical activities like this. I share this with you from the point of view of a novice who is becoming an adept, and I am trying to share what it feels like to be living a life that feels multi-dimensional, yet still very physical and connected to everyday reality, where there are ups and downs and in-betweens. The” in-between” energies are the focus of today’s healing journal. The in-between energies exist in a space that requires the balance, humbleness, and awareness that the universe is a much bigger construct than just what I want it to be in my individualized, ego-oriented mind. This is where I need to respect the Universe, and each person’s individual life path and choices, which sometimes conflict with my desires for perfect outcomes. 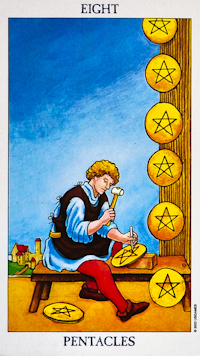 The tarot card I drew in association with today’s journal entry is the Eight of Pentacles, signifying apprenticeship, education, new skills, change, renewal, concentration, determination, diligence, hard work, perseverance, initiative, focus, patience, unfolding process, improvements, adjustments, honing skills, reassurance, investment, long-term goals, and ” any tendency towards perfectionism where you may lose sight of the bigger picture.” With that insight in mind, allow me to share these three healing experiences. The first healing I engaged in was on Thursday morning, after a dear friend shared with me the photo and story of a baby fighting for her life. For purposes of this article, I will give her the pseudonym Nell. Her birth was traumatic. Her mother was injured in a car accident, and Nell was born prematurely by c-section, the result being kidney damage and seizures for little Nell, who began her time on Earth fighting for her very life. I asked my friend if the family was open to allowing a healing for Nell, since she could not ask on her own, and my friend said that the family had gone public asking for prayers, donations and any kind of help at all. So, I had the green light to help Nell , and I immediately went into a half hour remote healing for the little girl that was struggling to live one state away. My friend also performed a remote healing for little Nell, and many other people were offering up prayers and donations for Nell and her family. The next morning, I was so excited to see that Nell had made it through the night, (even though the doctors cautioned the family and told Nell’s mother not to expect her to live through it to the next day, August 22nd) but then my friend wrote that her condition suddenly took a turn for the worse. So, I immediately stepped away from my work, and I began a second remote healing for baby Nell. Later that evening, I also participated in a group mediation and healing for Nell with about forty other people, where we all together sent Nell wonderful sparkling gold healing light to help her, along with everything that the doctors and medical teams at the hospital were doing on her behalf. Together, traditional science and metaphysical science are working in tandem, as we all try to contribute to Nell our love and light and prayers and medical technology in order to help her remain here with her family. Yet, there are much higher forces at work that none of us understand fully, including karma, destiny, fate, and freewill that are also involved in Nell’s life, and all of our lives. I see each of us as divine drops in the Divine Ocean, and no matter the outcome, we are all connected eternally, so no matter the outcome, in the bigger picture life always remains, just in different forms and in different realms of existence. I am happy to report that three days later Nell is still alive and getting stronger, fighting for her precious chance to experience the wonders of life on Earth with her family during these amazing times. The second healing I was involved in took place at the same gathering where we had done the group mediation for Nell. This was the monthly spiritual support group put on at a local candle and metaphysical shop. The meetings were created by Sherry Whitfield and the being known as Synergy that operates through an ancient Micronesian crystal skull that has a written history since the 1700s, and has an oral history within the “Real People” island tribe that dates back 40,000 years to the time of the first aborigines. It is my understanding that a multi-dimensional benevolent being who calls itself Synergy manifests its spiritual energy through this huge block of crystal that was carved into a skull millennia ago. Together, we share metaphysical experiences, we have drumming circles, group chantings, group meditations and visualizations. If desired individually or collectively, we can connect with Synergy’s powerful and intense positive, loving energy. We have a great time in coming together, and the support also comes from sharing with each other our experiences about our individual and very different metaphysical paths before the session, during the breaks, and afterwards. If you are sensitive to subtle energies, you may appreciate the qualities and vibrations that one can pick up from crystals when you hold them in your hand and go silent, just feeling the tingling or prickly or gentle waveform sensations that crystals generate and emit. In the early part of the evening during a drumming circle, I was allowed the honor to protect and carry around the ancient Lemurian crystal skull, that normally weighs about 15 1/2 pounds, to the many participants at the support group so that each could hold the skull and feel its qualities for themselves. At each meeting, there are usually a dozen or more newcomers who get the opportunity to meet Synergy, the skull of Joy as he is known to the “Real People” of Micronesia. Then, later in the evening, I was able to hold Synergy twice by myself for about five minutes each, and interact with Synergy’s energy on a personal basis. After the second time by myself, I stood up and was re-centering, and upon the advice of another friend, I grounded the energy from Synergy, by patiently waiting until my consciousness was fully balanced back into physical reality. Friday August 22nd 2014 was the fourth gathering of this spiritual support group, and that night, one of the men who regularly comes to these meetings arrived but was keeping to himself that he was in excruciating pain in the area of his left kidney and pancreas. I’ll call him Remy. Because Remy wanted so much to attend this meeting, he chose to endure his pain and still participated that evening, despite the excruciating agony he suffered through the whole evening. While we were beginning to clean and pack up four and a half hours after we had arrived, Remy approached me and asked if he could drop by my work where I offer healings, and I told him that there was no need to wait: we could do the healing here, so that he didn’t have to wait and suffer until a day came where he would have time to drop by my work. After Remy realized he was not imposing on me, he agreed and I allowed myself to channel the healing light energies through for him. I began with his head and sixth and seventh chakras, then moved to his heart chakra, then went from the top to the bottom of his spine, while he did his visualizations of white sparkling light filling his entire body. This helps to stabilize, energize and open up the person who needs healing. Then, I began to work on his left kidney area. After I had worked for many minutes, I felt it was time to stop, and Remy said that the pain was 90% gone. He smiled, amazed and happy. He mentioned that he still felt a twinge of pain that was “moving around” so I worked several minutes more, after which his side was now pain free. He was so astonished and relieved that he asked me to work on his knees, troubled by old football injuries he had suffered in his youth. Those pains went away, too. I checked once again, and then he explained that he still suffered from jaw pain and headaches due to a medical device he needed to alleviate dangers from sleep apnea. I will find out next month whether or not that additional healing work helped to lessen his sleep apnea issues. Afterwards, with just a few of us remaining to say our goodbyes to each other, Sherry and I shared with Remy a remarkable event that happened last month when I was doing a remote healing for someone who lives in eastern Pennsylvania. During the healing while we were both on speaker phone, the man said that he felt a “presence” enter the room, and he asked if I knew who the presence was. I told him that I did not, and had not ever experienced this before with anyone with whom I was doing a remote healing. However, I assured the man that I only allowed the most benevolent and loving energies to come through, and so after he explained to me that he did not feel threatened by it, we finished the remote healing session. Ultimately, the session was successful in greatly lessening the pain in both his wrists from a fall three months earlier, and the session helped alleviate chronic knee pain that he had suffered from for years. But to me, the most remarkable part of the story came later when he sent me a couple of e-mails to further inform me about the details of what he had experienced during that remote healing. The man from Pennsylvania wrote: ” I am still somewhat mystified by the “presence” I felt during the meditation. The best I can describe it was the feeling of “Casper the friendly ghost” flying straight towards me and into my face. There was a face, and a trailing body. As it “entered” my head, I felt a force – like a puff of wind – then is dissipated. I use a daily Medicine Wheel for protection, so I feel no fear of malevolence. It was an experience though.” I wrote back and asked for more details, and he replied: ” The Presence- – I was sitting – during the meditation on my last knee – my left. I was holding the sphere image in my head. All at once I “saw” (my eyes were closed) it descending from the wall in front of me toward my face. It was white with dark outline features. I noted that there were eyes and a wide mouth – smiling. Hair trailed long behind and trailed as if it were a body. it came at my face from above (45 degree angle). As it contacted my face (nosebridge) I felt it as if it were a puff of wind. It felt as if all of its being trailed in, but not out. It seemed to dissipate on contact – or about an inch or so in. After that, I felt nothing, other than a little shock and amusement.” I was flabbergasted when I read the e-mails. Sherry explained to Remy on Friday night, as she had to me one month ago, that the description the Pennsylvania man gave to me is exactly like what so many people have told her about when they have been healed by Synergy and seen Synergy manifest before their eyes. So, along with my normal guides, angelic beings, and higher- dimensional beings, it appears that I am now also able to communicate with and channel Synergy’s healing energies. How wonderful! This explained to me why I wanted to hold Synergy for so long that evening: I feel it was because Synergy was amplifying my fields in order to transmit greater amounts of healing energy for Remy, who I didn’t even know that I would be helping to heal that same night, just minutes after my third extended contact with Synergy. Synergy’s energy is quite intense. It causes some people’s legs to feel like jelly and some people’s ears to ring; some people have beautiful visions and feelings; some people receive telepathic messages; some people hear Synergy laughing or speaking; and then there are some people who just puke and throw up. I knew all this and yet I held Synergy for quite a long time on Friday, but now it seems clear to me why: to help Remy. However, not all of the healings I channel produce my desired instantaneous, positive outcome. The next morning, I was informed by a friend that his wife was dizzy, nauseous, had feelings of vertigo and had been throwing up. I had worked on both he and his wife over the last four years with positive results, so she was easily open to another healing. However, after this healing, she threw up and went to sleep. Hours later, her symptoms were persisting and she was dehydrated, so he took her to urgent care. She was diagnosed with Benign paroxysmal positional vertigo (BPPV), given some anti-nausea medication, and by today, Sunday August 24th, was feeling much better. So, I cannot say with any certainty that my healing helped her at all. It appears that modern medicine was more appropriate for her in this case. And this is where I have to acknowledge that sometimes what I do does not produce the instantaneous positive outcome that I always hope for each time that I try to help someone. One thing I can say about working with her is that I did channel much light and love to her, and that is always positive. However, this healing experience reminded me that I need to remain humble, balanced and aware that Divine Loving Spirit of the Universe will always determine the outcome. Sherry told me her approach to healing in a single, straight-forward sentence that night before we left: “Show up, do the work, and leave.” In other words: detach from the outcome after you have done the healing. Just before I learned of my healing gifts several years ago, I was helping several people in my circle who I was close to, and sometimes I found myself getting too personally involved in their personal issues. I wanted so much for their lives to improve, since they had shared with me their many problems and issues, but I became so involved that I placed myself beneath their needs, and lost my balance for a short term until I became aware that I needed to learn to “detach from the outcome.” That was part of my healing journey: learn to always send unconditional love, but also learn to detach and just hope for the best for them. One of those people passed away, one went a little crazy and moved away, one friendship was broken, and another one needed space to grow and make their own positive creations and mistakes. Another one was healed and continues to stay in contact, another has become a close family friend, and many others simply passed my way, were healed, and went on to their specific life journeys. I am new to being a healer. I have much to learn, much work to do and skills to hone, concepts to evolve, patience to apply, emotions to balance, but this is, as the Eight of Pentacles instructs, a life-long goal that I must concentrate on improving, and with determination and perseverance, this unfolding process will manifest into many more positive benefits and outcomes for many more people. I just need to remember that neither I nor my skills as a healer are perfect, and that “to detach from the outcome” and people’s personal dramas while still giving my utmost effort and love on their behalf is the best path to follow. The Divine Universe will decide. It’s not about getting recognition, or getting paid, or getting an ego boost, or getting some other form of compensation: it is about expanding our field of love to others around us in a pure and unselfish way. Love is the single greatest power in all of creation, and one cannot exert power or control over Love; instead, one must respect Love, its timing and allow it space to grow and shine to its fullest, most beautiful potential. That’s the type of healer I want to be. Post script: On Monday morning, August 25th 2014, baby Nell crossed over to the other side. Her family writes: “The great spirit has called forth our precious baby —. Our family is and always will be strong. We know that her spirit is with our grandmothers and our ancestors just waiting for the rest of us to join her! I love you baby girl!” My most sincere condolences to baby Nell’s family.